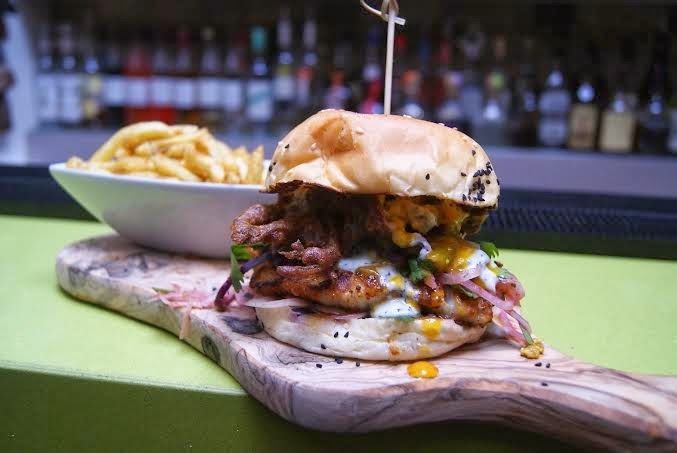 "Unique, juicy and straight out of Street Feast, Baba G's will be starting a residency with Apples & Pears, Aldgate-end of Brick Lane, from Thursday 10th April 2014 with their @BhangraBurger sliders. From Thursday to Saturday, 5pm until 10pm, they will be serving up delicious spicy burgers with a custom made Apple and Pear chutney. With fish and vegetable options, delicious bespoke Apples & Pears cocktails and a beautiful back garden to enjoy it in, there's plenty to love. The residency is for a limited time only. And as if that wasn’t enough to tempt you, there will also betwo hot, mouthwatering challenges. Apples & Pears and Baba G will be offering two cocktails and two meals for the person who picks a name for their new cocktail, created especially for the event. It contains Pink Pigeon Rum, yogurt, passion fruit, homemade garam masala syrup, cardamom bitters, orange bitters and salt. People can enter at the bar or via @ApplesPearsBar #eattweetbogof. Based on their famous Bhangra bullets these chilli pakora are guaranteed to fuel your thirst. The three chilli challenge will take three different chilies the Bullet, Indian Birdseye and scotch bonnet - (the Bhangra Bomb) each of these are hotter than the last. If you can eat all of these chilli Pakora in under 5 minutes you will get your name up on the wall o' flame and afree t-shirt. This three chilli challenge works perfectly with the ‘yet to be named’ Apples & Pears cocktail! #3chillichallenge."